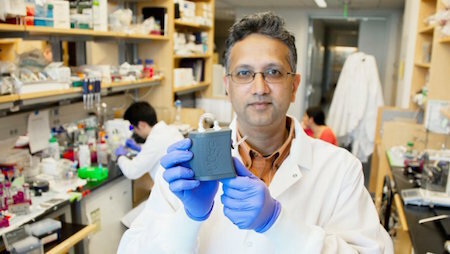 Shuvo Roy, PhD has created an implantable bioartificial kidney prototype, on a grant from the NIH's National Institute of Biomedical Imaging and Bioengineering (NIBIB). Dr. Roy is the technical director of The Kidney Project, headquartered at the UCSF School of Pharmacy. He is a bioengineer and faculty member in the School's Department of Bioengineering and Therapeutic Sciences. The medical device will be placed near the kidneys and connected internally to the patient’s blood supply and bladder. The kidneys will not be removed, but they will be bypassed. This medical device will be a permanent solution for organ transplantation scarcity and to treat ESRD successfully. If you are currently suffering from kidney failure and receiving dialysis, you should definitely continue to follow up on the development of the Kidney Project. If the researchers are successful in this new development, thousands of Americans will see a future without dialysis treatment. Via The Latest News and the The Kidney Project.